Vacation rental condominium. Sleeps 5, 2 bedrooms, 1 bathroom. No pets allowed. 7 night minimum stay condo upstairs unit with 2 bedrooms and 1 Bathroom upstairs spacious unit with 1 queen, 2 twins and 1 pullout sofa. . The unit comes with one assigned parking spot. There is alot to see and do in historic Key West. Enjoy touring noted Key West attractions including the Hemingway House, Southernmost Point, Truman's Little White House and Mel Fisher's Treasure Museum. After a morning of sightseeing, go for a dip in the shared pool or take a ten minute walk and beach it at Fort Zachary Taylor State Park, the best swimming beach in Key West. End the day with a pleasant sunset sail on a catamaran docked at the nearby marina - or join the crowd for the not-to-be-missed sunset party that happens every evening at Mallory Square. Whatever you choose to do, save your money on a rental car - everything is just a walk or bike ride away! So whether you are looking to party or just relax and enjoy the laid-back atmosphere of funky, historic Key West, this is the place! Our fully-equipped, comfortably furnished condo is sure to meet your every need. Grab your shorts and sandals, and head south to experience a little taste of Paradise! The location of the condo is perfect. Close enough to everything in Key West yet far enough to be peaceful. Condo was clean, well stock and comfortable for our family. We booked last minute and they helped make the booking easy and fast. We were very satisfied with our condo. Hello, Glad you enjoyed your stay. Awesome time. Great great place !!! We had a week here and had such a great time we didn't want to go home. The condo is well equipped and in an excellent location. Would certainly book again. Hello David, Glad you enjoyed your stay and look forward to seeing you again! They really made it so simple, fast and efficient. Ty Becky ! Hello Denise, Thank you for your feedback. We greatly appreciate it. Look forward to having you and your family stay with us again. This place was in a great location, just off Duval. Very clean and professionally run. Nice pool area. It was a little cozy for a family of five, with only one bath but everything else more than made up for it. Party store, bars and restaurants all within a short walk. Hello Barry, Glad you enjoyed your stay and hope to have you and your family stay with us again soon. We really enjoyed the condo. It was clean, updated, and well maintained. The complex is beautiful, with its walkways, gardens, and pool. We enjoyed sitting on the two balconies, listening to the roosters in the morning while drinking coffee. We rented bicycles our entire stay and were only a couple minute bike ride to Mallory Square or Fort Zachary Taylor Park. I've been to Key West many times and love the Truman Annex and Shipyard Condos. We checked in late. The management company made the checkin as smooth as possible. What I also enjoyed about this company is that we were able to stay a week and did not have to stay from a Sat. to Sat. This allowed us to be flexible with our travel plans. Thus unit was also the most affordable. We were grateful for this, being a family of 2 adults and 3 children. Hello Andrea, Glad you enjoyed your stay and hope to see you again soon. Excellent rental experience. Becky and Jaime at KWVP&R were superb. We highly recommend this agency. Hello Barry, Thank you and we are glad you enjoyed your stay. Looking forward to seeing both of you again soon. Great location. 3 blocks from Duval St. Clean and quiet. Hello Jeryl, Glad you enjoyed your stay. Hope to have you and your family stay with us again. Happy New Year! Great trip to Key West! Shipyard 253 was in the perfect location. We were able to walk to Duvall Street, Fort Zachary Beach and South Beach. The condo was equipped with everything we needed for the week. Check in and out was a breeze. Would love to go again and would stay at the same place without hesitation. The only negative thing I would have to report was that the main pool was being overhauled and we weren't notified when we booked that the pool would be out of commission. They had another pool but it was very small, dirty and crowded. We spent our days at the beach anyway so it wasn't a big deal but if you were a die hard pool person it would have been a big inconvenience. Overall, very pleased. The condo was immaculate and in a perfect location. I would recommend to families and couples. This place was perfect. Not knowing what to expect of the location, I was very pleased. It was located close to everything without being in the middle of it all. Rented a bicycle and that was all we needed to get to everything. (the beaches, Duval Street, restaurants, etc) The property was clean, the unit contained everything we needed, but we were a little disappointed with the pool. But overall, I would rent here again. Stayed at the Shipyard 253 and had a wonderful time. Very nicely decorated, comfortable and a great location - just 2 blocks from Duval St. I would stay there again! Great central location. Walking distance to most things of interest. Liked the fact it's a Gated community with assigned parking place. Not beach front, but that wasn't important to us. Would rent again. We absolutely loved KW and loved staying at Shipyard 253. It had everything we needed; it was clean,gorgeous kitchen, spacious &convenient to everything. Loved the front & back decks. Met so many nice people from all over at the pool and got some great tips. Great Location!!! We are already planning our next trip back to stay in this unit again. Overall this was an amazing experience and will reccommend to friends & family. We had a great time in Key West. Property was great, and you cannot beat the location. This rental was very nice. We have rented at the Truman Annex before renting a one bedroom. It was great having a deck with sun and a front porch that did not get as much sun but instead a nice breeze. The only improvements I believe are important to a vacationer is storage! There were no bureaus to put clothes in, so pack light! Also, it would have been nice to have a lounge chair on the deck. Other than that, very nice rental unit. Hello, Glad you enjoyed your stay, and thank you for your suggestions we take each one into consideration and pass it on to our owner. Tihis is our 4th stay at Truman Annex, great place, perfect location for us. hope to see you next year!!!!! Hello Gary, Hope to see you next year too!! Our stay at Shipyard 253 was awesome! We had 6 adults in our party and the 2-bedroom 1-bath was not a problem! The location of the rental is prime to all locations either walking or taking a cab. There is no need to rent a car, the next time we visit we will not rent a car and will stay at Shipyard 253.
we loved staying here! the location was great! the condo was perfect for our needs!! i would recommend and i would stay here again! Hello Beth, Glad you enjoyed your stay, hope to see you and your family again soon. Very happy with our experience!!! The condo was in such a good location and very well furnished. From paper towels to laundry detergent it had all the necessities. I would highly recommend this condo. There are few minor things that are minimal in cost that would have made our stay even better. Needs a new coffee pot. The lighting is very dim in the living room. An overhead light would be nice. It would have been nice to have a better coffee table in the living room. The current one is rather small and uneven so a drink could easily fall off. With those few adjustments the condo would have been perfect! Also, the property management was very nice and helpful. Would rent from again. Thank you for a great stay!!! Thank you for your feedback we greatly appreciate it and will make sure to pass this on to the property owner. Look forward to having you back! We had a great experience renting from KWVPR. The unit ws very clean and updated. Only recommendations would be to add a drying rack for clothes and some kitchen wash cloths for doing dishes since there is no dishwasher. The property was clean and centrally located to everything! Will definitely rent again; hopefully next year! We went to Key West on spring break with another family who also rented in Shipyard Condos. Or condo was great. Could have used alittle brighter lighting. The condo had everything we could ever want. The location was perfect. Walked everywhere we went except the grocery store. A/C was ice cold, the beds were very comfy.Kitchen was awesome. (does need a new coffee pot. Old one there still works but not very well) Will def. work on coming back next year.. Thanks for the great week. 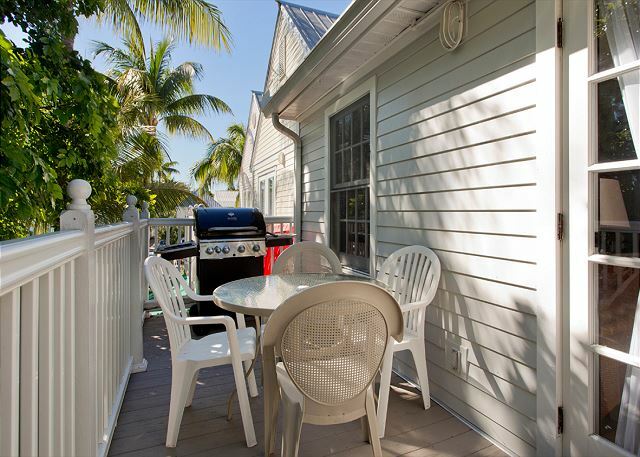 Great location, near Fort Zachary Taylor's beach, and very near Duvall street. And although very close, the community is very quiet and peaceful, well kept and lovely. Another great trip to Key West. The unit is very comfortable and Perfectly located, close to restaurants, beach, shopping. There is no need for a car, and renting bikes is a good option. Another great stay at 253! This was our third year of renting from KWVPR and once again enjoyed staying at 253. The new bedding and balcony furniture were nice touches, as were the new blinds in the bedroom! Everything was comfortable and in working order. Very much appreciate the shower flow was greatly improved from the last visit! Will stay again next year, just a different week as someone has caught on to our favorite spot! Thanks, Becky at KWVPR! We have rented at Truman Annex 3 times and all have been a great experience. Looking forward to next year!!! Hello, Glad you enjoyed your stay. Hope to see you again soon! I loved the location and the quality of the apartment. Some complimentary bikes would have been very nice. But everything was great. An incredible property that is perfectly located. Close to everything yet the perfect distance away for those who want to be away from Duval street. We had a group of 5 stay here and we were all extremely happy with the unit. The location was perfect, walking distance to most everything in Key West. The unit itself, was very nice. Lots of towels, beach chairs, washer & dryer. Plenty of space. The kitchen & bathroom appeared to have been recently remodeled. Everything about the unit was great. Would definately stay here again. stay here again when vacationing to Key West. The condo's location could not be any more perfect: two blocks from the Duval street, walking distance from the beach, pierce, restaurants, food market; although, the neighborhood is quiet. The condo is nicely furnished, with apparently recent remodels. Very well kept condo and grounds. Unit 253 was a PERFECT location in Truman Annex. A quick walk to the pool and walk/bike to the beach (we all LOVED having bikes; we even biked around the perimeter of the island one morning). Only two blocks to Duval Street and all the action was great! Only two small "issues". The water pressure in the shower was really poor. We learned to deal with it, but in hindsight we probably should have called and asked for someone to check it. It was as though a super water saver feature was installed in the shower head. The water pressure was fine in the sinks. I wish that there were more dish towels and bath towels. With 4 adults in the unit and cooking a few dinners, the towels were used up pretty quickly. I actually bought a six pack of wash cloths mid way through our stay because we were constantly running out :-). You can tell that the unit was recently renovated. The kitchen is awesome as well as the huge walk in shower in the bathroom. We used the gas grill a few nights to cook some Dolphin that my husband caught on a deep sea fishing trip. We will most definitely stay in this unit on a future Key West trip (and there WILL be a future trip :-)!!). Pros--Very comfortably decorated condo, Comfortable linens on bed, Fantastic location, Beautiful grounds. Cons--Water-saver shower is a trickle! This was our second stay in 253 and we were once again pleased with the condo! The newly updated kitchen is really nice. My only wish would be that the shower had more pressure! Looking forward to next year already!! The condo was beautiful and well supplied. It was nice to have things like extra TP and bar soap and dish soap and beach towels provided. The only negative would be the shower was at a trickle. Great location! Will try and stay in this complex again next year. With 3 women in the same unit only wish it had 2 bathrooms, but will search for that in the next unit next year! My wife son and I rented Shipyard 253 from Christmas to New Years. The place was fantastic. Quiet location in Truman Annex just a few blocks from Duval. Condo was clean and well decorated with a nice kitchen, bath and bedrooms. Plenty of towels were provided. Jamie from KWVPR met me at her office on Christmas Day to check in. Nothing but a positive experience with KWVPR. We can't wait to come back. We had a great time! The condo was very comfortable and the grounds very well maintained. We stayed at this property the last week of October 2010. It was the first time that we rented a condo in Key West. As per the reviews that I read, the first thing you notice is how very clean this place is. Plus, the location is so very close to everything in Key West...All within walking husband and I actually LOST weight after spending the week here! Nice pool, great in-condo washer and dryer, lots of towels, excellent appliances...Really, a fantastic rental...I'd highly recommend it! Great location, great property. Will definitely return if we come back to the area! Really Nice Condo! Enjoyed our Stay! We enjoyed staying at Shipyard 253 very much! The location can't be beat. A short walk to Kelly's and the Green Parrot. The pool was close by and very much enjoyed meeting some of the other residents. Would stay in the Shipyard again any time! great location, clean, comfortable and affordable. we stayed for two weeks and had a great and relaxing time. Close to all the action in Old Town KW. Great location ,very quiet! Will come back to this location. Walking distance to everything fun. You can walk to Duval st. Right down the street from the Green Parrot. Beautiful Views, nice pool. Excellant location,Very clean. We'll be back. A very nice townhouse. Everything went smoothly. The reservation procedure was a breeze. The location was great as was the condo itself. No problems and a very enjoyable week. Hope to be back again soon. Copyright © Key West Vacation Properties & Realty. All Rights Reserved.